The Qatar crisis failed to push oil prices higher as expected by those who had previously extended the so-called Vienna Accord. Yesterday, on June 7, the global market of crude oil got feverish. The reasons for that was all about the tensions around Qatar, which is an oil exporter from the Persian Gulf. First off, let’s take a look at yesterday’s stats. For the first time since May 5, Brent oil prices plunged below $48/b, all the way down to $47,98/b, Masterforex-V Academy experts report. As for the WTI futures for July delivery, the price got cheaper by 4,79% at a time, all the way down to $45,88/b, NordFX experts report. The experts say that the prices also got affected by the oil stats coming from the United States. In particular, in yesterday’s report released by the U.S. Department of Energy, it was stated that the commercial crude oil inventories had increased by 3,3 million barrels or 0,6% all the way up to 513,2 million barrels over the reported week. It’s interesting to note that analysts had expected a drop by roughly the same amount – 3,464 million barrels. This means that they totally failed to predict the actual figures. At the same time, the amount of gasoline and distillates in the U.S. inventories increased as well over the same reporting period. In this case, the increase was bigger than expected. However, the American oil stats still were secondary compared to the mentioned situation around Qatar, which is one of the world’s biggest oil nations. At first, some Arabian countries unexpectedly blocked Qatar earlier last week, which pushed oil prices 1,5-2% higher in an instance. However, this was a short-term reaction. Shortly after the increase, the prices instantly dropped 3% down. By Wednesday evening, the prices had already dropped below the level seen before the Qatar crisis. At first sight, nobody expected the oil market to react this way to the situation around an OPEC member. Still, Masterforex-V Academy experts say that if you dive deeper into the situation, there’s nothing to be surprised. For starters, Qatar is the weakest link in the OPEC chain producing the least amount of crude oil among the cartel members. Secondly, the previous expectations related to extending the Vienna Accord during the recent OPEC summit turned out to be overheated. 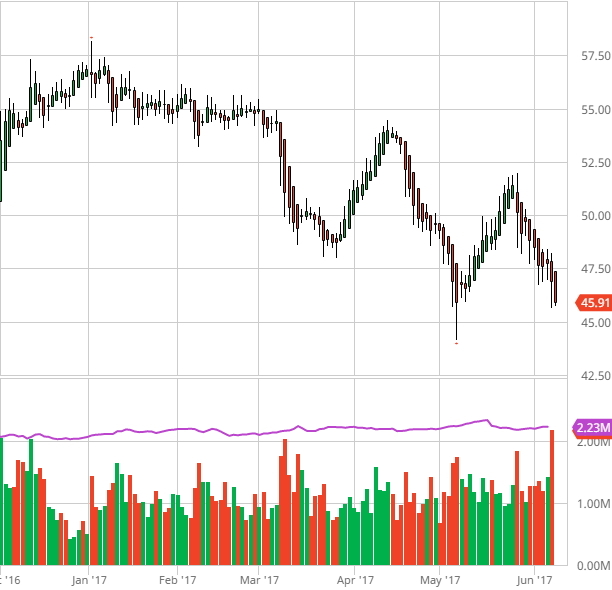 Oil prices had dropped 10% down since May 25 by the time the Qatar crisis broke out. Thirdly, the blockade has never interrupted or affected the export of crude oil from the Persian Gulf despite all the fears coming from international traders. And lastly, the confrontation on the Arab world undermines the prospects of OPEC consolidation, which may eventually lead to some of those members violating the agreement and starting to produce more oil, potentially by Qatar, Iran, Oman, and Nigeria. Some experts believe that international traders and investors will keep on getting more pessimistic over the Vienna Accord since they can see that OPEC has been continuously failing to implement their ambitious goals so far.